The following is a mainland Chinese blog post that has been cross-posted in many places already. The blog was created by a father concerning the mysterious death of his son. One day, the son was summoned to the middle school to pick up a graduation certificate. Instead, he met his death. According to the school, the son was caught stealing something at the school and jumped to his death because he was afraid of being punished for the crime. But the father observed that the injuries were hugely inconsistent with that description. Since then, the father has been frustrated with the ability to obtain the police reports (including the autopsy). However, the case has been blacked out in the mainstream media. He was interviewed by many local and national media, but somehow those reports could not be published Therefore, he has resorted to having his own blog on the case. There is no specific directive from the Central Publicity Department with respect to public discussion of this case. In that situation, it was up to the discretion of the individual blog service providers and forum webmasters about whether to carry or delete the related blog posts. The father is a professional writer and he seems to be careful about what he writes. However, he needed to remind people "to be rational when you comment and not over-reach." (Liao Zusheng 廖祖笙's blog) December 6, 2006. Mengjun, we will always remember you! My only son Liao Mengjun was sixteen years old this year. Before he died, he attended class 906 at the Huangqi Middle School in the Nanhai district of Foshan City, Guangdong province. 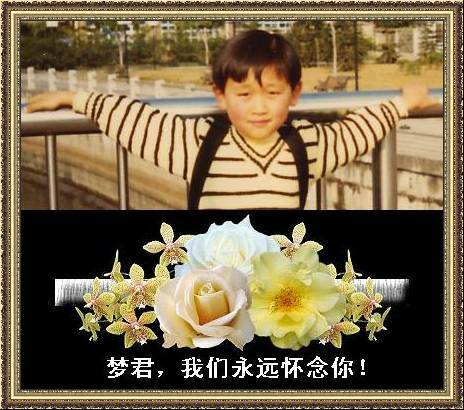 Since the first year of elementary school up to his death, he was always a class cadre, a "Triple Excellence" student and a "civilized" students. His grades were always around the top of the class. In the year when he died, he was the class's study commissar. He was always described as a "genius" at every school that he studied at. Our family has also maintained good relations with all the previous schools that he attended. The opinions of his fellow students, the stack of prizes, certificates and report cards from the schools and the written evaluations from his teachers all proved that the character and diligence of Mengjun was irreproachable. Historically, Huangqi Middle School has been overcharging tuition. After the "single fee" system was introduced for free compulsory education in China, they continued to overcharge. In the second half of the second year in junior high school, I had already had a house in the Huangqi area for many years. But the school still insisted that my child had to pay the higher rate. I wrote a letter to the school with the subject title "I firmly oppose arbitrary tuition charges" in which I said that I refused to be exploited. The school leader invited me to go to the school and told me that this can be treated as "a special case handled in a special manner." So my child ended up paying the low fee. In the third year of junior high school, a political teacher named Tan from Xinhui was appointed the class master for Mengjun's class. Tan could not speak standard putonghua and his Cantonese was not authentic either. The students were having a hard time following the lessons. When school started, we asked for the child to be transferred out of that class, but Mr. Liang refused. Most of Mengjun's classmates thought that Tan was unqualified and also unsuited to be the class master because he tended to drone on a single subject past class time. He also likes to curse people out publicly. After the arrival of Tan, my child's days of torment began. He was harassed in many ways and publicly humiliated. For example, other students can be late for 20 minutes but Tan would just let them enter the classroom without any questions. But if my child was late by so much as one minute, he would be sent off the stand in the corridor without any chance to explain For a trivial matter, Tan once called my wife six times in one day to "complain." Our whole family "could not stand him," but we dare not speak up. When the middle school entrance exam was near, Huangqi Middle School suddenly demanded me to produce the original copy of the deed to my house. Since I took out a mortgage loan in order to buy the house, I could not produce the original copy until the loan was fully paid off. The school then insisted that I must select Huangqi Middle School as my child's first preference and I was told that the associated fee was 30,000 RMB. Afterwards, I found out that a property owner only needs to produce the sales contract and that the original title deed is not required. I am a professional writer who pays quite a bit of attention to the problems of young people in school. Since this matter affected me personally this way, I began to write more critically about education. During that period, I wrote several essays that criticized what the school was doing and the accumulated flaws of the educational system. Thus, I was targeting the senior official in the Department of Education. The teachers at the school then increased their efforts to torment my child. Concerning the school choice, the worst day was when three teachers from Huangqi Middle School talked together with my child for more than three hours in one day. He even missed dinner at school. My child described the experience as "continuous bombardment." Liang told my child twice that he was going to thrash him. Tan assaulted my child twice. Two days before the middle school entrance exam, he throttled my child around the throat and punched him in the ribs in front of all the children over some squabble about an eraser. Afterwards, he made my child move his chair and table into the teachers' room to face the wall for the entire day. I was very angry that evening, and I threatened to sue Tan. Tan rushed over to my house to apologize. I refused to let him enter my house. I stood in the courtyard and lectured him. Afterwards, I transferred my wife's hukou to this district and the child was able to enter high school here instead. But even as when the days of torment ended for my child, the death occurred. From the above description, it can be seen that there was a process by which hostilities built up. After the bloody murder, the police investigators did not ask the family of the deceased for any hints. They even forcibly chased away the eyewitnesses who wanted to provide tips. This is very unusual in the history of criminal investigation of murder cases. At 4:11pm on July 16, my wife suddenly received a telephone call from a student, who said that the class master Tan wanted Liao Mengjun to go to the school to pick up the certificate of graduation and the notification of admission. Tan admitted later that he had asked a student to make the telephone call on the night of the incident. So my wife went downstairs to find the child. They changed their clothes, they went to buy some football lottery tickets, and they took the bus to the Jiazhou Plaza. Because my wife disliked the teachers, she did not want to see them. So she told the child to go alone and then meet her at the Book City afterwards. They split up about 5pm. My child walked alone to Huangqi Middle School, and the murder happened immediately. An eyewitness saw three teachers and one security guard chase my child from the sports ground to the third floor. At 5:10pm, the Huangqi Middle School called the police, which meant that the murder had occurred by that time. The body fell down from the fifth floor. An eyewitness said that the child was motionless when he reached the ground. He was already a dead corpse and the bleeding was as small as the rim of a rice bowl. Before he hit the ground, there were no cries. When the medical doctor arrived, he turned the body over for examination. The police arrived late, and what they observed was different from the original scene. Once professionals were told about where Liao Mengjun fell and how the body laid, they were certain that the body was tossed out instead of the rumored "suicidal leap." The child was beaten to the point where his brain was hemorrhaging, his right forehead was dented, he had blood coming out of the eyes, ears, nostrils and mouth, his face was battered with clear bruises from punches, his neck showed signs of strangulation, both his shoulders were broken, his left hand was stabbed three times, his right hand was stabbed once, his left abdomen was punctured, his thigh was slashed, his liver was injured, his lungs were dislocated, his left leg was stabbed twice, his right foot was bruised and swollen, a piece of flesh was missing from his right leg so that the bone was exposed ... any adult (not to mention a child) who suffered such a beating could not have gotten up. At the first autopsy, I asked an expert person to join me as a "family member" and he watched the entire process. He believed that my son was hit in the head with a stick and the head injuries alone were fatal already! 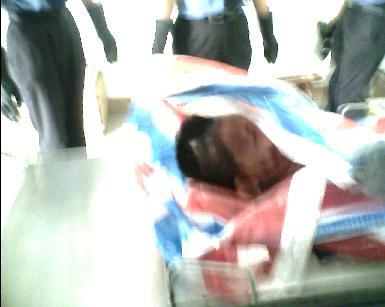 I and my lawyer understand the police conducted two autopsies. The second autopsy was done without my approval and I was not present. After the murder, the relevant local authorities behaved strangely. Faced with a murder, they decided to "unify their public statements" and covered up the truth by all the possible means. Liao Mengjun's class master Tan was interrogated that evening by the police. So the identity of the deceased was known. Yet the police only contacted the family eight hours afterwards. At the time, I and my wife were at the police station filing a missing person report. We asked the police to tell us if our child was dead of alive. My wife was in tears as she got down on her knees to beg for an answer. But the police officer firmly insisted that he "had to wait for an order from his superiors." That evening, the police told us that "several more people will have to be arrested." But we are told now that "there is no murderer," "Liao Mengjun committed suicide" and "the school did no wrong and has no responsibility"! On the day after the tragedy, reporters from six media outlets including Southern Metropolis Daily and Guangzhou Daily came to cover the story. But their written reports were squashed that evening by an order. Afterwards, many more reporters came to cover the news. Either their requests to interview were rejected by the authorities, or else their written reports were suddenly squashed. A certain influential media outlet in Beijing sent several reporters to spend several days to cover the case. The word that they used most frequently to characterize this case was -- "Dark!" Several days after the murder, the local media issued a deeply flawed "news report" in the interest of "unifying the public statement." This was quickly condemned by the public. The family, the lawyers and the media reporters were not allowed to go to the scene of the murder. Someone told us that the bloodstains on the 2nd, 3rd and 5th floors have been scraped off and painted over. There were no fingerprints of my child at the suspected scene of burglary. The police based their report on several footprints and they wanted us to believe that our beloved child was "suspected of theft" -- "intentionally assaulting the teachers" -- "committed suicide due to dread of punishment for the crime." A witness can prove that Deng "did not know who injured him" The public is dubious about the injuries that occurred to Deng. I have asked the authorities many times to let me meet with Deng to see those injuries. But this request has never been granted. Deng's wife also teaches at the school, and she is the Politics teacher. I attempted to take photographs of the external injuries of my child on three occasions. I was forcibly prevented from doing so. The lawyer wanted to collect information at the funeral parlor, but he was also prevented from doing so. On the day after the murder, reporters from five media outlets wanted to take photographs of the injuries of Liao Mengjun, but they were prevented from doing so. The murder occurred on July 16. As of today, the family of the deceased has not yet received the autopsy report and our lawyer has not seen a single file related to the case! Although the relevant departments urged me to quickly "deal with" the body of my child, they were also pressing me to pay a storage maintenance fee. I have formally signed a document to ask the funeral parlor to keep the body for a longer period of time. But now they are saying that I need to file a written application at the Civil Affairs Bureau and get their approval, or else they will cremate the body. My Sina.com blog is a place for me to tell about the injustice. But my blog posts are frequently deleted. Related posts at the other forums are also frequently deleted. The Chinese media continue to be collectively silent. A murdered student died without getting justice. The murderers not only got away, but they are continuing to "educate" the next generation! On August 2nd, I used my mobile telephone camera to take this one photograph.